Robert Brindley's Blog: New DVD In Stock Now!! 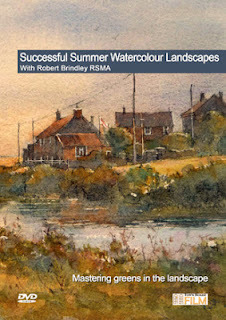 I've just received stock of my new DVD 'Successful Summer Watercolour Landscapes'. Thanks to everyone who has pre-ordered a copy, we will post them to you today. Beautiful cover... have just ordered 2 copies - 1 for me, and 1 as a gift! This DVD came yesterday, and I have watched it 3 times already. Robert Brindley, and Town House Films are a force to be reckoned with.